I think it's safe to say that this picture is better than most Michael Bay movies. 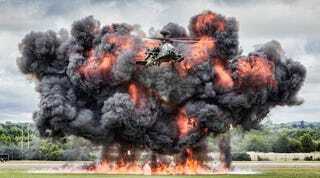 Taken by Cpl Neil Bryden of the British Army, it shows an Apache attack helicopter flying away from a gigantic fiery Godzilla smoke monster explosion. So damn cool.